ZaftigKnitting | Fat Knitting Superhero, disguised as Mild Mannered Yarn Shop Employee. illusion knitting, a photo by ZaftigWendy on Flickr. This is probably the simplest and most classic heel flap of all. First I’ll give you the pluses and minuses and then the how-to. It’s the easiest of all heels to repair if it gets a hole. It feels smooth and looks smooth and classic. It can actually be kind of boring. It’s the most likely to need repair. For me the pros definitely outweigh the cons. This is the sock heel that I use THE MOST (at least on top-down socks). It feels good in my shoes, it looks good, it’s easy. Trifecta. Row 1: To get started, knit across the stitches (1/2 of the total stitches in the sock) that you’ve designated for the heel. DO NOT GO ON IN THE ROUND! You’re going to go back and forth now, so TURN so that the purl side is facing you. Row 2: With the purl side facing you and working back across the stitches just knit, slip the first stitch purlwise, with the yarn in front, then purl to the end of the heel. Turn to the knit side. Row 3: Slip the first stitch purlwise, with the yarn in back, then knit to the end of the heel. Turn. Row 4: Slip the first stitch purlwise, with the yarn in front, then purl to the end of the heel. Turn. Repeat rows 3 and 4 until you have as many rows in the heel as you have stitches in the heel. In other words, if you have 28 stitches across your heel flap, then you want to make it 28 rows tall. Usually. What do I mean “usually?” Well, here’s the very best place to customize the fit of your sock. The flap of the heel should reach from the place where your ankle bends in back to the very bottom “corner” of your heel. Some of us have tall heels and high insteps and some of us have low heels and a lower instep. What is your foot like? To find out, do the heel flap as written – an equal number of stitches and rows. This is sometimes referred to as a “square” heel. Then try it on (yes, with the needles in there!) and see if the flap begins and ends at the right place. Remember, the top of the heel flap (where you divided it from the leg) should be right at the place where your ankle bends. The bottom of the heel flap should be almost exactly at the bottom “corner” of your heel (on my foot, that’s right where the. You want to slightly stretch the flap when you’re checking. If it’s too short, work another couple of rows. If it’s too long, rip out a few. You do want to make sure that the last row of your heel flap is a purled row. 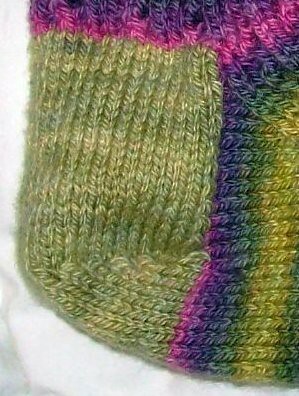 Next, we’ll talk about the Slip Stitch Heel Flap. It may be a few days, as I’ll be away in Wyoming over the weekend, and I need tomorrow to pack. And to finish the mittens I’m knitting because it’s COLD in Northern Wyoming, and I don’t own any gloves that have fingers. I never needed ’em here in Hot Antonio and fingerless gloves are SO MUCH faster to knit! I would very much like to thank Dr. Dain Franks at the Texas MedClinic, who I truly believe saved my life. I encourage all of you to seek medical attention when you have symptoms that don’t make sense. In my case, it was severe back pain, flu-like joint & muscle aches, fatigue, and fever. I thought that I had a weird flu that didn’t involve respiratory symptoms. I wish I had gone to the doctor sooner than I did. If I’d waited another day or so, I might’ve had to be hospitalized. Don’t be me. If you have a fever over 101°F, and you’re older than 20, GO TO THE DOCTOR IMMEDIATELY! Grown-ups don’t get fevers like that, unless they’re seriously ill. I wish you all a long LONG healthy life full of much yarny joy! It’s been fun. I haven’t succeeded 100% at posting every day, but I’ve posted more than ever before, for SURE! My friend Elin‘s pattern is finally available for download! It’s a hat modeled on the St. Edwards Crown (the coronation crown for the English monarchy). 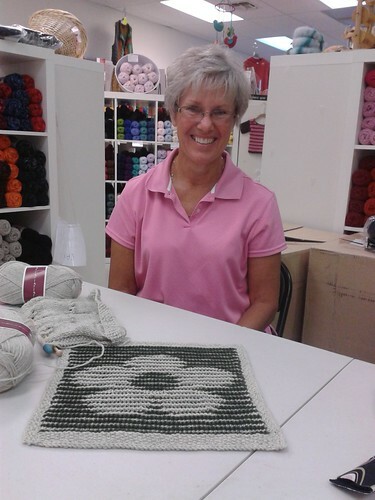 It’s not an easy knit, what with the beading and double-knitting, but it is a FUN knit! 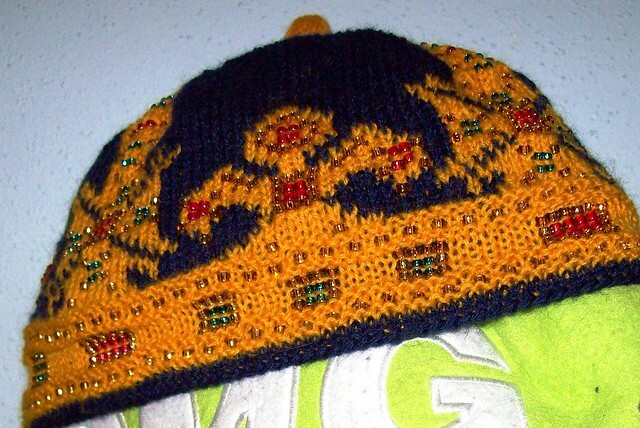 Here’s the link, and below is a photo of my finished Crown-Hat.